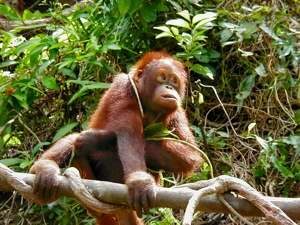 Visit Borneo is a global Borneo portal, focusing on orangutans and other endangered Species , unique wildlife and nature, sustainable development, conservation projects, responsible travel and sustainable tourism information, holidays, sports and leisure activities. Visit Borneo also provides resources for expats and people relocating to Sabah and Sarawak on Malaysian Borneo, Kalimantan on the Indonesian Borneo, and Brunei Darussalam. The island of Borneo is home to many unique and endangered species, such as the orang utan, proboscis monkey, the Borneo Rhino, the Pygmy Elephant, as well as the Green and Hawsbill Turtle. More wildlife is discovered by the scientists who live and conduct research in the many national parks, rainforests, mountains and remote regions on the island. Several conservation projects have been set up in Brunei, Sabah, Sarawak, and Kalimantan in collaboration with local governments, the WWF, research institutions, nature and other wildlife and nature and environmental not for profit organisations. Sabah, Sarawak, Brunei, and Kalimantan are easily reachable by plane from abroad. Borneo has several international airports. More distant travel within Sabah, Sarawak, Kalimantan, or Brunei mostly takes place by plane or boat. There is a wide selection of hotels, resorts, inns, guest houses and backpackers available to cater for tourists, business travellers and expatriates alike. Borneo has become a very popular holiday destination in recent years. Polular Borneo holidays include adventure holidays, jungle trekking holidays, beach holidays, orang utan and wildlife safaries, bird watching, and diving. Many visitors spend their honeymoon, Chinese New Year, Easter or Christmas at one of the many top resort hotels. Many popular tourist hotels and resorts are located only a few miles outside Kota Kinabalu in Sabah, as well as outside Kuching or Miri in Sarawak, which are great starting points for many Borneo tours to its wildlife, nature and cultural attractions. Borneo offers great opportunities for scuba diving, particularly off East Sarawak and off the islands of Sabah, mountain climbing, caving, golf, fishing, and rafting. Borneo tour operators may be able to help in arranging a sports holidays, particularly diving, fishing, golf and adventure treks.